The University of Miami is recognized as a Bike Friendly University, at the Bronze Level, by the League of American Bicyclist. Our continuous goal is to encourage bicycling as a recreational and sustainable transportation option for our campus community. We promote biking as a mode of sustainable transportation for students, faculty, and staff. 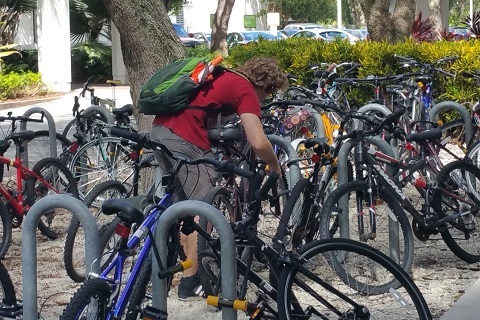 As a Bike Friendly University, we continuously work towards improving the biking environment as recommended by the League of American Bicyclist. Improvements include the addition of bike racks, covered bike racks, and wider sidewalks providing a safe and enjoyable biking experience around campus. To start taking advantage of the amenities, including repair stations, air pump stations, and access to showers, bring your bicycle and Cane Card to the UM Police Department, located at the ground floor of the Flipse Building and register it with UMPD. Receive a free U-Lock when you register your bike. The UM Bicycle Club offers free bike repairs every 2nd and 4th Sunday of the month between 1:00 p.m. and 4:00 p.m. at the Rock. Visit the Bike Club for free minor repairs. Use your bike to get to campus all while staying healthy. Also, combine bicycling with the Metrorail as your commute to campus and save on the cost of a parking permit. Access UBike FAQs here. Find the closest repair station and bicycle parking rack to you. In the event of an EMERGENCY? Make sure you enroll in the Emergency Ride Home (ERH) program through this link and receive 6 ERH vouchers when you register your bike commute. For Bike commuter renewals click here.